[Featured Image Description: Book cover for ‘The Umbrella‘] All images in this post are book covers from the preceding text. The best kids books to inspiring creativity and imagination through times of turbulence. With a constant stream of bad news, never-ending tasks, and so much of the world left in despair, our kids are in danger of losing hope. Let’s not confuse childhood innocence and wonder with ignorance – we still have a responsibility to educate our kids on the realities of the kyriarchy so we can smash it. But we can’t forget whimsy – or silliness and fun. My kids need to see what is good and possible in the world if they have any chance of building a better future. It’s up to us to nurture that hope. To foster big ideas in little minds, we need to see the big picture. I’m a planner – so I have to remind myself to get a little irresponsible. Getting lost in possible obstacles and too much reality squelches great adventure before it sprouts. All of us – littles and grown-ups alike, need to reserve some sense of wonder. We need room to breathe, imagine, and space in our minds for ridiculousness and whimsy. Captioned age ranges are for when my sons got ‘the gist’ of the story with discussion & alternative readings – most contain text for much older ages. I though it would be too surreal, but Q loved the power and control ‘My Pen‘ gave the narrator as he created new worlds and alters reality through illustration. An artist has to explore an idea – how to make it BIG, how to make it deeper, how to give it more meaning and dimension. Otherwise it’s just marks on paper, pixels on a screen, or rubbish on a museum floor. ‘The Dot‘ is art Big Ideas 101 for every artist and innovator. If you liked ‘Beautiful Oops!‘ when your kids were younger, and believe mistakes are an opportunity to pivot and create something transcendental, ‘The Book Of Mistakes‘ is your next favorite. ‘Mr. Flux‘ brings unwelcome change to the neighborhood when he introduces the idea that art isn’t a painted canvas, it’s the exploration of new ideas. Patience is virtue – until it’s time for Beekle to take matters into his own hands in the ‘Adventures of Beekle.’ With a similar plot (and both stories are about imaginary friends), from another perspective, ‘Marilyn’s Monster‘ is the story of a little girl who takes action when waiting isn’t enough. ‘The Puddle Pail‘ shows us new ways to look at ordinary things, and how a some thought can lead to new creations. ‘If I Ran The Circus‘ explores a little boy’s wildest dreams as he imagines the future of a dilapidated junk-lot. ‘Chalk‘ sparks kids to imagine what could happen if they happen upon a bit of magic. In ‘Flotsam,’ we imagine what fanciful sea creatures do beyond the margins of the shore. 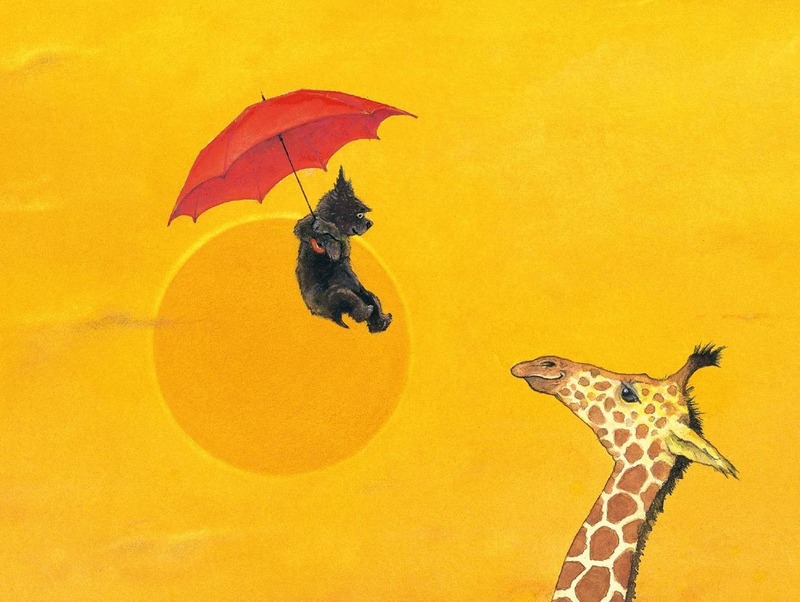 ‘The Umbrella‘ is about big adventures sparked by ordinary things. Both ‘Beyond The Pond‘ and the ‘Journey‘ trilogy features kids diving through ordinary portals (doors, ponds, you get the idea) into an fairy tale land of adventure. Seuss’s ‘The Places You’ll Go’ contains too much metaphor and the text is so long that even patient little readers have a hard time sitting through it. ‘Wherever You Go’ is a modern spin on the old classic that’s even more more engaging and gorgeously illustrated. In ‘The Whisper,’ a girl finds a magic book with missing words, prompting readers to come up with their own stories. ‘This is Sadie‘ features an imaginative little girl who creates her own adventures with every resource available. In ‘What Do You Do With An Idea‘ (which has grown into a series since this post was first published), the symbolism of an idea as a cute little egg is a metaphor even littles can understand. Don’t miss out on the best and brightest stories igniting the next generation of luminaries. Sign up for email updates below, and we’ll let you know when we find more awesome stories for kind & brilliant kids. We can keep hope and joy alive.